VNC Connect is simple to use, which makes it even easier to deploy to everyone in your organization. There's no bloat, so you're not paying for features you don't need. Use the mouse and keyboard (or touchscreen) in front of you as though they belong to the remote computer. Send special keys and combinations such as Ctrl-Alt-Del, and copy and paste text in either direction. Type in confidence that characters will be interpreted correctly, whatever your platform, keyboard or input language. As the original inventors of VNC technology, we know how to create a responsive screen sharing experience that's as good as being there. Our patent-protected technology automatically optimizes to the speed of your network, and is especially effective in low-bandwidth and high-latency environments. PC to PC and mobile to PC across Windows, Mac, Linux, Raspberry Pi, iOS and Android. With an Enterprise subscription, you also get a key to install our VNC 5.x software on a wide range of older and UNIX operating systems too, so your legacy hardware remains accessible. Connect whether remote computer owners are present or not. 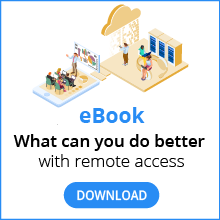 Remotely access your own computers, monitor or patch equipment in the field, support customers or colleagues, and much more. Learn about the many ways our customers use VNC Connect. Our cloud service automatically brokers cloud connections between devices wherever they are. So you don’t need to rely on a VPN, or conduct complex and insecure port-forwarding and firewall configuration. With an Enterprise subscription, you can establish direct connections as well (or instead), perfect for locked down or offline network environments. For more information, start with our document cloud versus direct. Add device access to your subscription, install VNC Connect on every device you own or manage, and enable access by anyone at any time. Alternatively, add instant support to your subscription and connect in seconds on demand, leaving no footprint. Or add both capabilities, and cover every remote access use case. During a session, you're not restricted to just interacting with the remote screen. You can transfer files in either direction, print files directly to a printer where you are (rather than to a printer attached to the remote computer), and securely chat with other users connected at the same time as you. VNC Connect is built from the ground up with security in mind, to balance the control you need with the privacy that compliance requires. Sessions are encrypted end-to-end using up to 256-bit AES encryption. Authentication is mandatory at the point of connection and never delegated to the cloud. Protect your computers with multi-factor authentication, single-sign on (SSO), granular access control and rich session permissions. VNC Connect is available in French, German, Spanish and Brazilian Portuguese as well as English, with more translations on the way. Manage remote computers, the people you invite into your team to share remote access with, and their roles and permissions from one central location. With an Enterprise subscription, you can deploy VNC Connect in bulk, offline or remotely using your standard enterprise tooling. In addition, you can configure VNC Connect remotely using policy, and lock it down to prevent change. With an Enterprise subscription, you can create virtual desktops on Linux computers. This might be useful to enable visual remote access to headless Linux systems, or provide separate workspaces for simultaneous users of a shared resource.